Volcano View VIP Villas are Santorini's most exclusive luxury accommodations perched high on the caldera cliffs overlooking the sea and volcano. The villas are crafted in traditional Cycladic architectural style and offer the warmth of Greek Island charm and the convenience of modern amenities. Each villa is like your own little house on the cliff with its own private pool and spacious cliff-side yard overlooking the sea and Santorini's unique Caldera view. The villas are peaceful located 2km away from Fira town and guests may take advantage of the hotel's complimentary shuttle service to town 6 times per day. These 5 star accommodations offer a high level of service and many amenities. Room Service, 24 hour concierge service, free laundry and ironing service, free airport/harbour transfer, complimentary buffet breakfast served to the villa, safe, complimentary shuttle bus service to town (9:00-22:30), Restaurant, pool bar, private phone number with fax machine, computer, printer and complimentary internet access and writing desk, hydro massage tubs, business meeting centre, CD/DVD player and satellite TV, bathrobes and slippers. Services on Request: Massage in your villa, Hair Make-up and other personal services at your villa, private yacht or jet charters, car hire, personal security servives. Spacious cliff side yards with private fresh water pools, motor bike care hire, massage and beauty appointments upon request, excursion and yacht charter upon request. 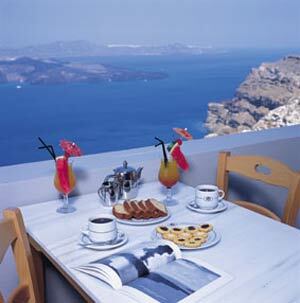 The villas are located 1800 metres from down town Fira (the capitol of Santorini). Είστε ιδιοκτήτης ή διευθυντής στο VOLCANO VIEW VIP VILLAS; Εγγραφείτε τώρα για δωρεάν εργαλεία, που μπορείτε να χρησιμοποιήσετε για να βελτιώσετε την καταχώρησή σας και να συνδέσετε την ιστοσελίδα σας και το σύστημα κρατήσεών σας.